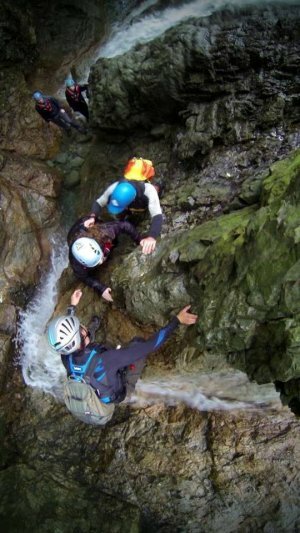 Gorge Scrambling is suitable for groups of all abilities and ages and gives a unique experience exploring the hidden depths of deep rivers and gorges. We will climb waterfalls, swim through deep pools and include some jumps into pools if desired. We can choose different routes within the gorges giving different levels of challenge across the same group, we also have a range of gorges on offer giving different levels of technicality. As we move and work as a group this activity is a very social and fun activity that promotes team-work throughout. Thorough briefs and demonstrations will be given buy our qualified instructors who will be at hand to help out and watch over all aspects of the activity and guide everyone individually through the techniques required in the gorge. If you think you might like a more technical version of this see Canyoning – Jump, Slide and Abseil.